The State Government’s utility concessions will be increased annually in line with the Consumer Price Index to assist people on low and fixed incomes with cost of living expenses. 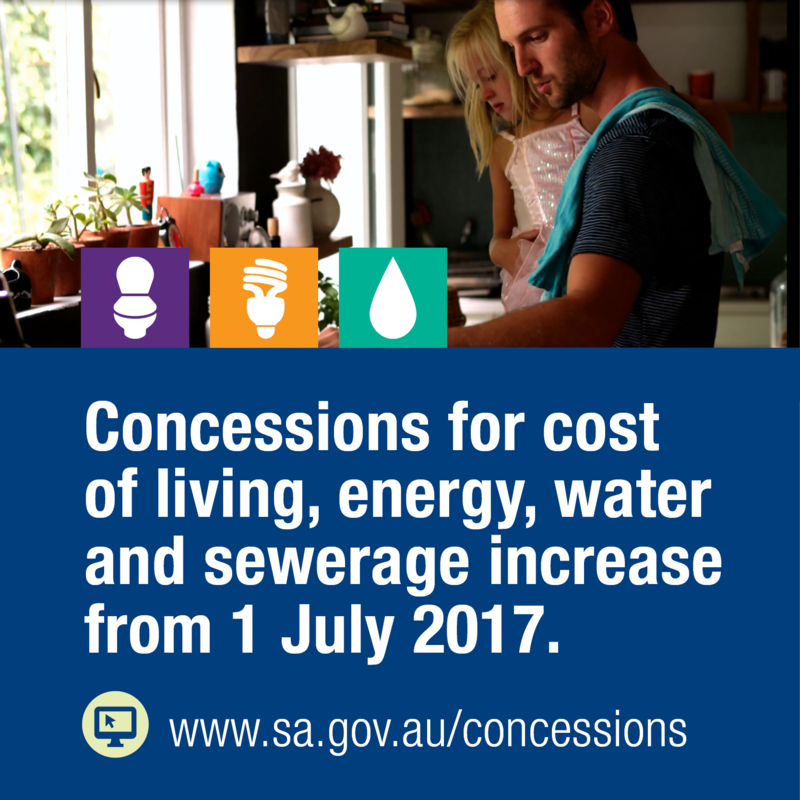 This is the first time that concessions have been indexed in South Australia and it was effective from 1 July. Increased utility concessions will benefit South Australian pensioners, retirees and low-income earners. During 2016-17, almost $173 million was provided in concessions to reduce the living costs for people on low and fixed incomes. By 2019-20 eligible households are expected to receive up to an extra $54 in concessions. This will equal around $14.5 million extra per year for some of the state’s most vulnerable households. The increases will be applied automatically, and customers do not need to reapply. Cost of Living Concession, energy, water and sewerage concessions will assist eligible households by up to $1,048.90 in 2017-18. The Cost of Living Concession was introduced two years ago. Pensioners, retirees and low- income earners can apply for the concession. The Cost of Living Concession is worth up to $202.70 this year for eligible homeowners and $101.40 this year for eligible renters. To find out more about concessions, including eligibility criteria, visit www.sa.gov.au/concessions or call the Concessions Hotline on 1800 307 758. This indexation from 1 July is a continuation of the government’s commitment to helping those most in need in the community with cost of living expenses.